Prospective applicants and their families may book a visit during the fall and winter semesters (September to April). Tours are usually held on Friday, begining at 12:30 pm, and are approximately 50 minutes in length. Tours outside regular availability, such as on weekends or in the evenings, are possible only if a tour guide is available. From May to August, visits to OVC are limited due to tour guide availability. Tours require two-week advanced booking, and groups greater than 12 participants require extra notice. 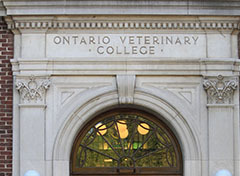 For OVC Tour reservations, please contact 519-824-4120 Ext. 54430 or email vetmed@uoguelph.ca. Please Note: There is a strict no photography or video recording policy in the veterinary teaching hospital and in areas where animal patients are present. If you tour the college during warmer weather, we ask that you do not wear open-toed shoes or sandals. *Due to hospital policy, we cannot allow children under the age of 12 on tours. However, you may bring chidren under the age of 12 to Open Houses.